INS Kalavari, a diesel electric attack submarine, is a Scorpene-class submarine and is the first of the six submarines being built in India under Project-75 by Mazagon Docks Limited with a technology transfer from France's DCNS (Direction des Constructions Navales Services), a naval shipbuilder, according to The Hindu. The Scorpene submarine has been named Kalvari after the deadly deep sea predator of the Indian Ocean the dreaded Tiger Shark. Built by India's prime shipyard, Mazgaon Dock Shipbuilding Ltd. or MDL, INS Kalvari (S51) is the first of 6 submarines to be commissioned. 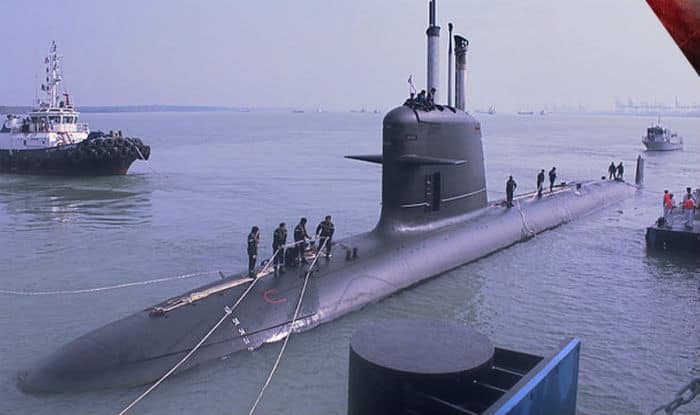 Post delivery, the submarine would soon be commissioned into the Indian Navy. It was decommissioned on May 31, 1996 after nearly 30 years of service, a statement said. The event also marks the Golden Jubilee of the Submarine Arm for having completed 50 years of Indian submarine operations. The Navy follows a tradition of naming new ships based on the decommissioned ones. The attack can be launched with both torpedoes and tube launched anti-ship missiles, whilst underwater or on surface. These stealth features give it an invulnerability, unmatched by most submarines. The submarine can be part of anti-surface warfare, anti-submarine warfare, intelligence gathering, mine-laying and area surveillance. "It is a potent platform, marking a generational shift in submarine operations", the statement added. With the Kalvari submarine, MDL has proven to walk the "Make in India" path, which is being actively implemented by the Department of Defence Production (MoD). The second of the Scorpene under construction at MDL, Khanderi, was launched in January 2017, and is now undergoing the rigorous phase of sea trials. The Scorpene leak saw 22,400 documents expose secret stealth capabilities of the submarines, diving depths, and specifications of torpedo launch systems among other details, reported Hindustan Times. The remaining submarines are in various stages of outfitting, it added. All the Scorpene submarines were supposed to be ready for use by this year.